I'm now 29 weeks, nearly 30 weeks pregnant and haven't had the most straight-forward of pregnancies. We found out we were expecting very early and so it feels like i've been pregnant forever! I've found my anxiety has been really bad throughout my pregnancy, you can read my post all about my anxiety here. I've found myself worrying about every little niggle, ache and pain. Since 26 weeks we've been having regular scans and check ups as bubba is measuring a little small and this has also given me reason to worry. I see my midwife every week, sometimes every two weeks because of my anxiety and this helps as I get to hear bubbas heartbeat every week and I know if i've got a question I can just ask the midwife at my next appointment. For more urgent queries and questions I can give her a call or I can call the hospital but sometimes you can have a question or just want some peace of mind and I don't know but sometimes I feel like a nuisance calling or texting my midwife every 5 seconds. For some ladies their midwife might not answer their phones or they can forget to reply to text messages. Maybe you don't feel that comfortable asking your midwife such a personal question or feel that you can't talk to your midwife? 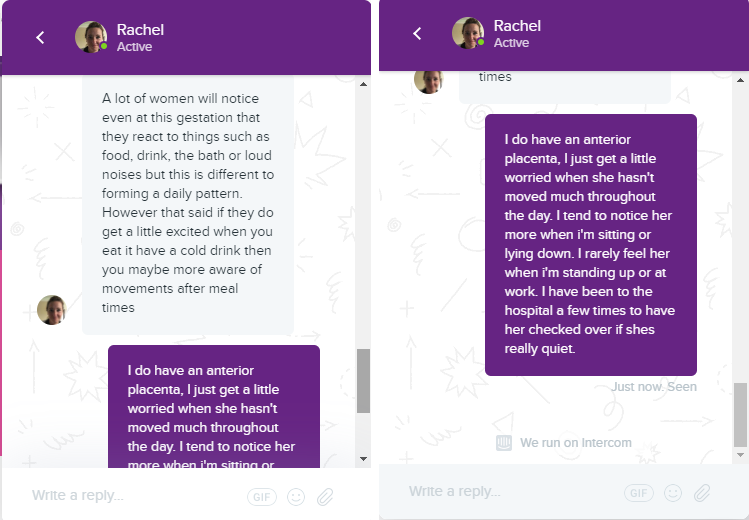 I was recently contacted by the lovely ladies at Ask the Midwife to give their service a go and let them know what I thought. Ask the Midwife is the first online health advice service, run by registered midwives. 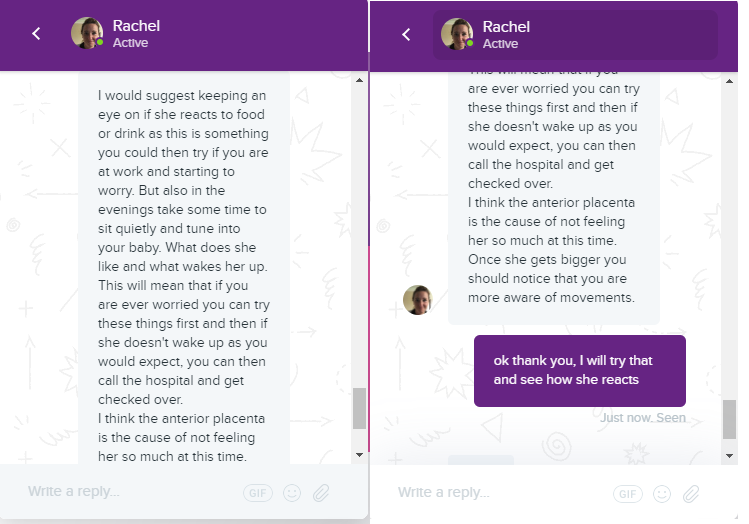 I have used the Ask the Midwife on a few occasions over the last month or so... as I mentioned above our baby is measuring small which has caused some worry and raised a few questions. I find the chat format of the service really helpful and easy to use. It's so easy to start a chat, and there's different payment options so you can just ask a question or maybe you'd prefer to sign up for a month. I received a reply pretty much straight away and felt that the reply was very informative and friendly. I didn't feel silly and I didn't feel like I was being a nuisance. 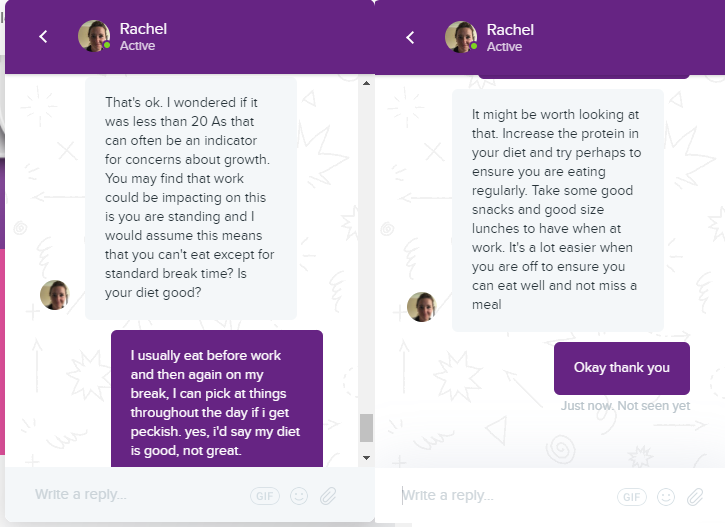 Rachel was very helpful and put my mind at ease and once she had finished helping me she asked if there was anything else, and I asked another question because I felt very comfortable talking to her and it was lovely to get some advice and answers to a few questions I had. I felt really comfortable talking to Rachel and I like the idea of someone always being there to answer any questions I may have. The wait for a response isn't too long and you know that you are getting good advice and knowledge from an actual qualified midwife. I found myself google-ing symptoms and questions very early on in my pregnancy and this can be scary. Some of the responses and answers I found on forums were horrible and made me jump to the worst possible conclusion. I would really recommend the Ask the Midwife service, especially if like me you have a lot of questions and don't really want to keep bombarding your midwife. You can feel like your being an annoying first time mum and like your probably annoying your midwife. The Ask the Midwife service lets you ask all of those questions and you know you are getting good valid advice and information. I have found myself going over to the Ask the Midwife page instead of looking on Google if I have a question. 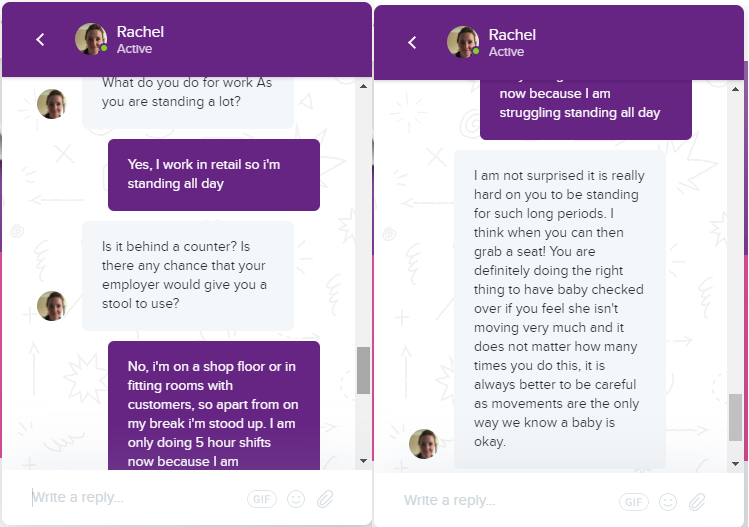 I've included some screen shots of some of the questions I asked so you can see the type of reply I got back and to give you an idea of how the service works. They have different subscription services so you can pay to ask just one question or you can pay to have a chat or you can even opt for a monthly subscription. The monthly subscription gives you the freedom to ask questions at any time and there's always a registered midwife on hand to answer your questions.